This is an old and discontinued model of TankBot. View the most recent model or all released models. TankBot is the most versatile and precise module in the GroLab™ family. It could be described as a complete controller that is able to cover all the aspects of tank management. However, this description is not enough because TankBot is much more than that. 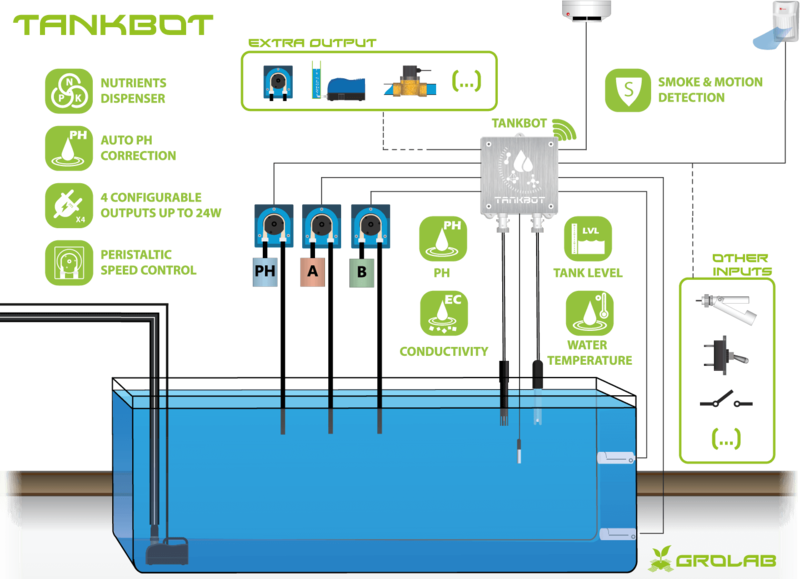 PH & water temperature regulation, nutrients dosing, water level management and tank refill/drain are just some examples of the TankBot capabilities. Supports up to 4 actuators of 12v allowing to connect a wide variety of devices like water pumps, solenoid valves, peristaltic pumps, relays, air pumps and power contactors. With the capability to independently control those 4 actuators makes it possible to automate a variety of systems like irrigation, lighting and air flow. TankBot is capable of challenging the user’s imagination. This powerful module is not only capable of monitor and control the pH, EC and water temperature, but also offers the possibility to connect 4 extra switch sensors of your choice like water level sensors, motion/smoke detectors or switch buttons. Extending the TankBot capabilities to the surveillance and security domains, granting GroLab™ system a huge amount of options to react/notify in case of any security threats/issues arises. TankBot will not simply free you from the boring management tasks, but it will also help to keep your grow(s) protected. TankBot can provide power to all peripherals of your growing environment. It has 4 connectors that supports 12v actuators allowing a wide variety of devices like water pumps, solenoid valves, peristaltic pumps, relays, air pumps and power contactors. Using power contactors or relays extends the module capabilities to control any kind of device, providing a huge amount of options to automate a variety of systems like irrigation, lighting and air flow. This module gives you the possibility to deep analysis, monitor and control the pH. The GroLab™ system programmable procedures offers several options to regulate pH based on the user needs. TankBot also supports EC probe extending the monitor and control of your water tank to another level. GroLab™ system can notify you and even react based on electrical conductivity of your water. TankBot provides all you need to continuously regulate the water temperature ensuring the optimum conditions for your plants to grow. Connecting peristaltic pumps on TankBot opens the door to the nutrients dosing domain. GroLab™ system provides all the necessary tools to calibrate the peristaltic pumps and to create procedures to precisely pump the required nutrients amount. TankBot provides the capability to customize device speed. This feature can improve the precision even with low cost devices. Thanks to the capability of handling actuators of 12v, it is possible to create impressive irrigation systems that can independently feed multiple grows. This module supports 4 extra switch sensors of your choice like water level sensors, allowing to continuously monitor the water level of your tanks. With the right peripherals connected to the TankBot, like solenoid valves or water pumps, user can create procedures to automatically drain and refill, allowing a complete tank maintenance. TankBot allows you to create safety protocols & procedures to avoid risk situations or even react to them in order to minimize the damage. Fires and intrusions are some examples of risk situations this module can handle. With the support for switch buttons it is possible to shutdown all devices or specific areas/grows simply pressing a button. There are also 2 main security features included on TankBot: the cool-down time which prevents damage to devices that need some time to cool down before turning them on and the security actions when losing communication with GroNode (the system's core module). All of these makes the TankBot a life saver for any grower. TankBot communicates with GroNode (the system's core module) through radio frequency with a range of 25 meters indoors (depending on obstacles) and 100 meters in open spaces. This makes it easy to install the TankBot close to the water tank. Using GroLab™ Software the user can monitor and analyze the different pH, EC, temperature and the 4 extra sensors in real time. The software provides you notifications, charts, grow(s) overview and even allows you to export the sensors values from the beginning of your grow(s) life cycle. When you provide Internet connection to GroNode (the system's core module) it can send real time alerts and updates to your e-mail about the state of the sensors and devices connected to TankBot. It will also notify you in case of any issues arises. When connecting the GroNode (the system's core module) to a router with an Internet connection, it allows you to activate the GroLab™ system's remote control. This feature grants user access from anywhere at any time through an easy-to-use software. Allowing to fully control all the modules, including TankBot.